Much of the ocean is severely overfished with some species teetering on the brink of collapse. By harnessing big data and artificial intelligence, Global Fishing Watch, a platform founded by Google, Skytruth, and Oceana, provided the first near real-time view of large-scale fishing activities around the world. Launched in 2016, it has proven to be a critical tool for fish population management and in protecting critical marine habitats. Today we’re adding two new data layers to increase transparency and awareness around fishing activity, in order to ultimately influence sustainable policies. Illegal, unreported and unregulated (IUU) fishing accounts for an estimated $23.5 billion worth of fish annually worldwide(that’s one in every five fish that goes to market). Transshipment—one of the methods used to conduct IUU fishing practices—occurs when one fishing vessel offloads its catch to a refrigerated vessel at sea, making it easier for illegally caught fish to be combined with legitimate seafood. This typically occurs in regions of unclear jurisdiction or just outside of a country’s national waters. It often goes unreported and unnoticed and sometimes provides cover for human rights issues of bonded labor and trafficking. By using machine learning to classify over 300 thousand vessels into 12 types, we can then identify when a fishing vessel is alongside refrigerator vessels for a sufficient amount of time for a transshipment. Regulations vary widely for transshipment, so the data does not suggest illegality—rather, it reveals patterns and hotspots where events occur, the vessels involved and provides a new perspective into this sometimes abused practice to further investigations around specific incidents as well as general policy discussions. 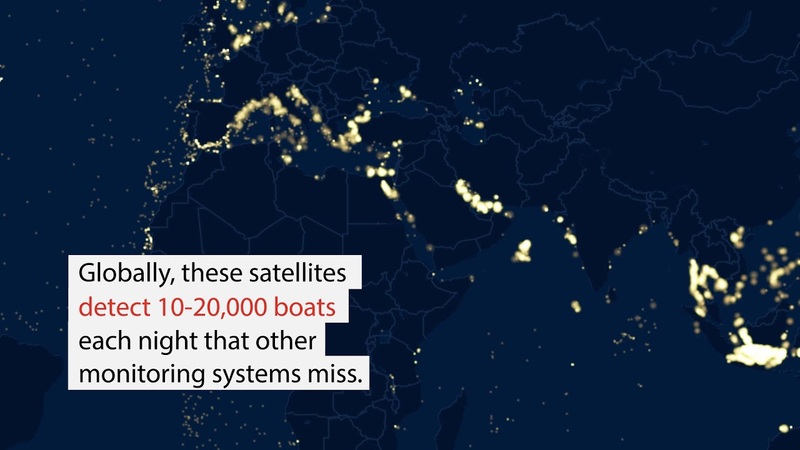 Lighting up the Dark Fleet Not all fishing vessels carry GPS broadcasting devices like Automatic Identification Systems (AIS), and there are technical complications in some dense regions that prevent full reception. So getting a comprehensive picture of fishing activity is challenging. Global Fishing Watch now publishes the location of brightly lit vessels operating at night The U.S. National Oceanic and Atmospheric Administration (NOAA) produces this data from weather satellites that image the entire Earth every night that are sensitive enough to detect light emitted by a single brightly lit vessel. For example, Squid Jiggers —a practice poorly regulated in many regions— fish at night by illuminating the water surface to attract their catch. These operations range from small wooden boats with basic lights, to massive industrial vessels with the equivalent of sports stadium lighting. While we do not get any identifying characteristics or visuals of the detected vessel, it enables us to show an additional 10 to 20 thousand boats for a more complete view of fishing activities.